Protect Me Feri Ferret is hand made in the finest white, brown and black cuddly soft plush and carries the famous Steiff trademark, Button in Ear with the Yellow tag. A cute guy is Protect Me Feri Ferret. The ferret from the marten family belongs to an endangered species. Its habitat in the forests of Europe is getting smaller every year. The lovable, 25 cm large ferret shows all its beauty with the paintings and shades, which were designed in elaborate airbrush technique. His black legs are a nice contrast to the white body. Friendly looks the white, provided with brown and black shades face of Feri Ferrets. Feri wants children and adults to look around and see how great and worth protecting nature and its habitat are. 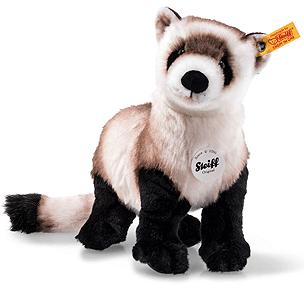 But of course, the cute ferret made of cuddly soft plush also wants to cuddle and nestles in the child's arms. The magical Protect Me Feri Ferret is a friend who creeps on every inch of his heart.